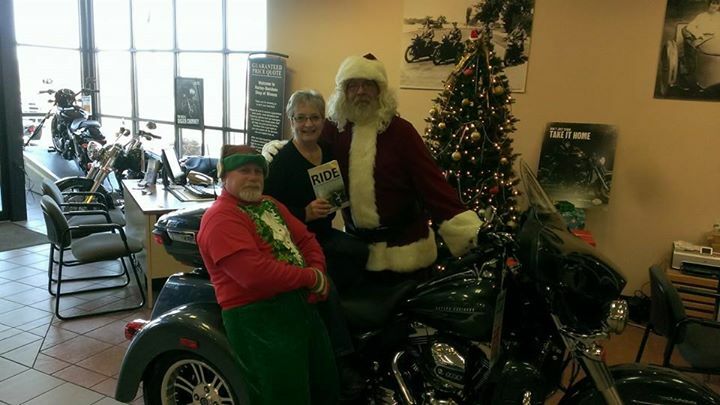 Santa and his helpers check out a new way to deliver copies of Ride Minnesota. Recently, I’ve had the pleasure of doing book signings at Mankato Harley-Davidson and the Harley-Davidson Shop of Winona to promote my book, Ride Minnesota. It’s always fun to meet and talk with people who are passionate about something, and Harley owners are passionate about riding motorcycles. They’re also extremely brand loyal. Years ago, it was not uncommon to walk into an H-D dealership and see a brand-new bike on the showroom floor with a piece of cardboard underneath it to soak up the oil that puddled on the tile. Fortunately, Harley cleaned up its act (and its motorcycles). It’s easy to see why it’s still the number one motorcycle in the U.S. (although Victory is making inroads). When you walk into a Harley-Davidson dealership, you’re greeted with a smile. The place is spotless and the bikes are beautiful. The Harley-Davidson logo is everywhere, from the floor mat in front of the door to the restrooms, where antique-looking signs advertise H-D motorcycles from days gone by. The parts department carries Harley-Davidson branded parts and motor oil. The “motorclothes” department has and exciting array of jackets, scarves, hoodies, T-shirts, baby clothes — you name it, you can find it — all emblazoned with that distinctive shield. There are shot glasses, beer mugs, Christmas ornaments and a gazillion H-D trinkets. At the Winona store, I sat on a bar stool that had the logo carved into the seat. I stood up from time to time to make sure it wasn’t impressed into my rear-end! The most impressive aspect of these dealerships, however, are the people who work there. They’re enthusiastic and friendly. They know their customers and treat them like extended family. In fact, I know of no other store where folks can just hang out all day and shoot the breeze. Most Minnesotans have put their bikes in storage for the year. But you can still dream about motorcycling, and read about it, too. Go to Amazon and order a copy of Ride Minnesota. It makes a great Christmas stocking stuffer!